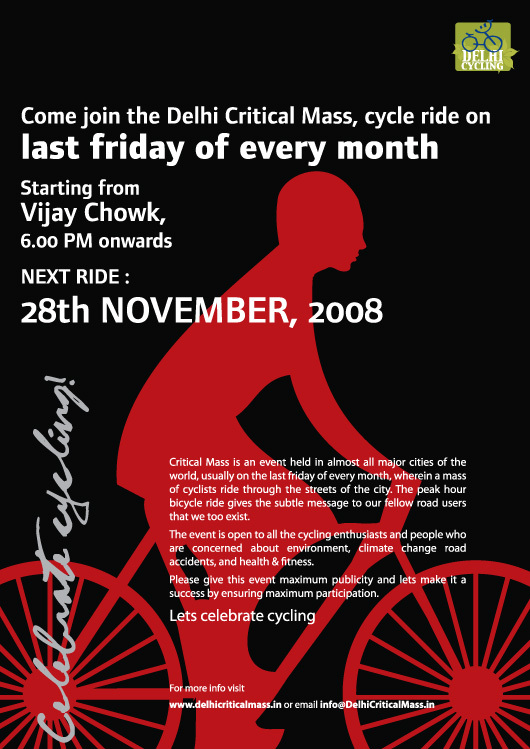 Critical Mass is an event held in almost all major cities of the world, usually on the last Friday of every month, wherein a mass of cyclists ride through the streets of the city. The peak hour bicycle ride gives the subtle message to the motor-drivers, that cyclists exist too! The event is open to all the cycling enthusiasts and people who are concerned about environment, climate change, road accidents, health & fitness etc. 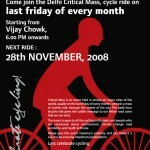 NEXT Delhi CRITICAL MASS: Friday, the 28th of November, 2008! The idea is also to celebrate cycling!